The Israeli acute paralysis virus (IAPV) is a honeybee-infecting virus that was found to be associated with colony collapse disorder. The IAPV genome contains two genes encoding a structural and a nonstructural polyprotein. We applied a recently developed method for the estimation of selection in overlapping genes to detect purifying selection and, hence, functionality. We provide evolutionary evidence for the existence of a functional overlapping gene, which is translated in the +1 reading frame of the structural polyprotein gene. Conserved orthologs of this putative gene, which we provisionally call pog (p redicted o verlapping g ene), were also found in the genomes of a monophyletic clade of dicistroviruses that includes IAPV, acute bee paralysis virus, Kashmir bee virus, and Solenopsis invicta (red imported fire ant) virus 1. Colony collapse disorder (CCD) is a syndrome characterized by the mass disappearance of honeybees from hives . CCD imperils a global resource estimated at approximately $200 billion . For example, it has been estimated that up to 35% of hives in the US may have been affected . Many culprits have been suggested as causal factors of CCD, among them fungal, bacterial, and protozoan diseases, external and internal parasites, in-hive chemicals, agricultural insecticides, genetically modified crops, climatic factors, changed cultural practices, and the spread of cellular phones . The Israeli acute paralysis virus (IAPV), a positive-strand RNA virus belonging to the family Dicistroviridae, was found to be strongly correlated with CCD . It was first isolated in Israel , but was later found to have a worldwide distribution [4, 6, 7]. The genome of IAPV contains two long open reading frames (ORFs) separated by an intergenic region. The 5' ORF encodes a structural polyprotein; the 3' ORF encodes a non-structural polyprotein . The non-structural polyprotein contains several signature sequences for helicase, protease, and RNA-dependent RNA polymerase . The structural polyprotein, which is located downstream of the non-structural polyprotein, encodes two (and possibly more) capsid proteins. Overlapping genes are easily missed by annotation programs , as evidenced by the fact that several overlapping genes were only detected by using the signatures of purifying selection [9–13]. Here, we apply a recently developed method for the detection of selection in overlapping reading frames  to the genome of IAPV and its relatives. We identified a strong signature of purifying selection in cluster A that contains overlapping ORFs from four genomes: IAPV, Acute bee paralysis virus (ABPV), Kashmir bee virus (KBV), and Solenopsis invicta virus 1 (SINV-1) [16–18]. This ORF overlaps the 5' end of the structural polyprotein gene (Figure 1A). The detection of purifying selection is based on a method for the simultaneous estimation of selection intensities in overlapping genes . To ascertain that each overlapping ORF is indeed subject to selection, we used the likelihood ratio test for two hierarchical models. In model 1, we assume no selection on the overlapping ORF. In model 2, the overlapping ORF is assumed to be under selection. If model 2 fits the data significantly better than model 1 (p < 0.05), then the overlapping ORF is predicted to be under selection and is most probably functional. The signature of selection was identified for the ORFs in the three bee viruses (IAPV, ABPV, and KBV). The protein product of the orthologous ORF in SINV-1 could not be tested for selection because the amino acid sequence identity between the ORF from SINV-1 and the ORFs from the three bee viruses (Table 3) is lower than the range of sequence identities for which the method can be applied (65-95%). Sequence conservation in comparisons of known orthologous proteins and orthologous products of overlapping ORFs. Phylogenetic trees and schematic representation of the dicistrovirid genomes (a. structural polyprotein; b. non-structural polyprotein). Trees were inferred using the neighbor joining method  and rooted by the mid-point rooting method . Numbers above and below the branches are bootstrap values (1000 replications) and branch lengths (amino-acid substitutions per site), respectively. Phylogenetic analyses were conducted with MEGA . The approximate locations and sizes of the known genes (blue), overlapping hypothetical genes (red, green, and orange), and singlet ORFs (gray) are noted in the three reading frames. An additional indication for selection on these ORFs was obtained by comparing the degrees of conservation of the hypothetical protein sequences of the overlapping ORFs against the protein sequences of the known genes (structural and nonstructural polyproteins, Table 3). The degree of amino-acid conservation and, hence, sequence identity between orthologous protein-coding genes is influenced ceteris paribus by the intensity of purifying selection. If both overlapping genes are under similar strengths of selection, the amino-acid sequence identity of one pair of homologous genes would be similar to that of the overlapping pair. On the other hand, if a functional gene overlaps a non-functional ORF, the amino-acid identity between the hypothetical protein sequences of the non-functional ORFs would be much lower than that between the two homologous overlapping functional genes. We found that the degree of amino-acid conservation of the overlapping sequence identity between pairs of overlapping ORFs in cluster A is only slightly lower than that of the known gene (maximum of 12% difference between IAPV and SINV-1 in cluster A, Table 3). In contrast, the amino-acid sequence identity between ORF pairs in clusters B and C is much lower than that between the pairs of known genes (maximum of 44% difference between CrPV and DCV in cluster C, Table 3). The signature of purifying selection on the ORFs in cluster A suggests that they may encode functional proteins. We provisionally term this gene pog (p redicted o verlapping g ene). In Figure 1, we show that pog is found in the genomes of four viruses that constitute a monophyletic clade, but not in any other dicistrovirid genome (Figure 1A). Its phylogenetic distribution suggests that pog originated before the divergence of SINV-1 from the three bee viruses. The phylogenetic distributions of the ORFs in clusters B and C (Figure 1B) are patchy. This patchiness is an additional indication that the overlapping ORFs in clusters B and C are spurious, i.e., non-functional. 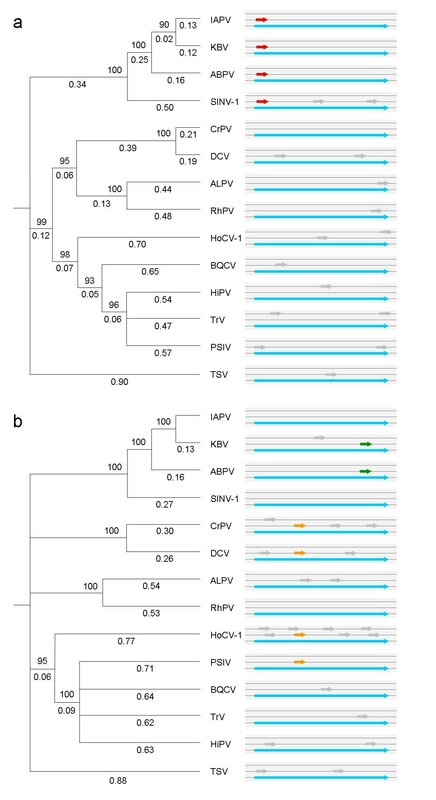 An examination of the DNA alignment of pog (Figures 2) reveals a conservation of the first potential start codon (ATG or CTG) in the +1 reading frame in three out of the four viral genomes (IAPV, ABPV, and SINV-1). As seen in Figure 3, this conservation cannot be explained by constraints on the overlapping polyprotein, in which the corresponding site is variable and encodes different amino acids (His, Asn, and Pro, in IAPV, ABPV, and SINV-1, respectively). We note, however, that we did not find a conserved Kozak consensus sequence  upstream of the potential initiation site. This situation is similar to that described in . Codon alignment of the 5' overlap region between the structural polyprotein and the hypothetical gene. The alignment is shown in the reading frame of the hypothetical gene. The annotated initiation site of the polyproteins is underlined. The first potential initiation site (AUG or CUG) of the hypothetical genes is marked in red. The last stop codon at the +1 reading frames is marked in green. The amino-acid alignment of the overlap region between the structural polyprotein and the hypothetical gene (+1 reading frame). The annotated initiation site of the polyproteins is marked in blue. The first potential initiation site (AUG or CUG) of the hypothetical genes is marked in red. The last stop codon at the +1 reading frames is marked in green. Transmembranal helixes predicted by MEMSAT  are marked in blue. 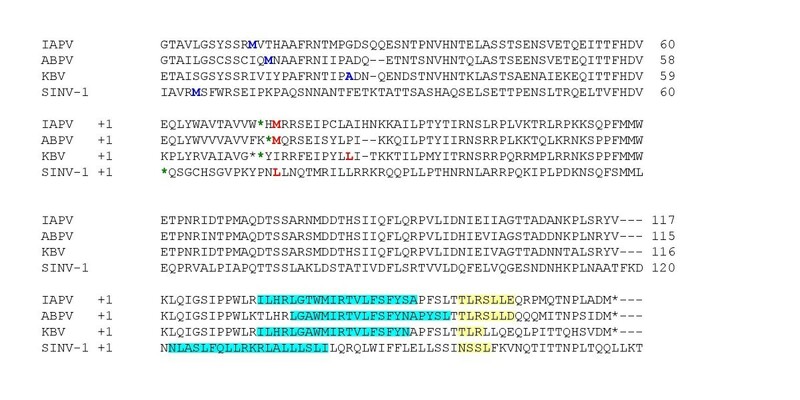 Conserved protein kinase C phosphorylation sites predicted through My-Hits server http://hits.isb-sib.ch/cgi-bin/PFSCAN are marked in yellow. A protein motif search resulted in several matches, all with a weak score. Two patterns were found in all four proteins: (1) a signature of rhodopsin-like GPCRs (G protein-coupled receptors), and (2) a protein kinase C phosphorylation site (Figure 3). Prediction of the secondary structures  suggests that the proteins contain two conserved helix domains, separated by 3-5 residues (except for SINV-1, in which one long domain is predicted), at the C-terminus (Figure 3). A search for transmembrane topology  indicates that the longer helix may be a transmembranal segment (Figure 3). Although viruses often use GPCRs to exploit the host immune system through molecular mimicry [22–25], the lengths of the proteins encoded by pog are shorter than the average virus-encoded GPCR. Therefore, these proteins may have a different function. In this note, we provide evolutionary evidence (purifying selection) for the existence of a functional overlapping gene, pog, in the genomes of IAPV, ABPV, KBV, and SINV-1. To our knowledge, this putative gene, whose coding region overlaps the structural polyprotein, has not been described in the literature before. Fourteen completely sequenced dicistrovirid genomes were obtained from NCBI (Table 1). Each genome was scanned for the presence of overlapping ORFs. We used BLASTP  with the protein sequences of the known genes to identify matches of orthologous overlapping ORFs (E value < 10-6). Matching overlapping ORFs were assigned into clusters. Within each cluster, we aligned the amino-acid orthologs by using the sequences of the known genes as references. If alignment length of the overlapping sequence exceeded 60 amino-acids, and if the amino-acid sequence identity among the hypothetical genes within a cluster was higher than 65%, we tested for selection on the hypothetical gene (see below). We aligned the protein sequences of the two polyproteins with CLUSTAW  as implemented in the MEGA package . Alignment quality was confirmed using HoT . We reconstructed two phylogenetic trees (one for each polyprotein) by applying the neighbor joining method , as implemented in the MEGA package . Trees were rooted by the mid-point rooting method  and confidence of each branch was estimated by bootstrap with 1000 replications. We used the method of Sabath et al. for the simultaneous estimation of selection intensities in overlapping genes. This method uses a maximum-likelihood framework to fit a Markov model of codon substitution to data from two aligned homologous overlapping sequences. To predict functionality of an ORF that overlaps a known gene, we modified an existing approach for predicting functionality in non-overlapping genes . Given two aligned orthologous overlapping sequences, we estimate the likelihood of two hierarchical models. In model 1, there is no selection on the ORF. In model 2, the ORF is assumed to be under selection. The likelihood-ratio test is used to test whether model 2 fits the data significantly better than model 1, in which case, the ORF is predicted to be under selection and most probably functional. We looked for motifs within the inferred protein sequences encoded by the overlapping ORF by using the motif search server http://motif.genome.jp/ and the My-Hits server http://hits.isb-sib.ch/cgi-bin/PFSCAN with the following motif databases: PRINTS , PROSITE , and Pfam . We used PSIPRED  to predict secondary structure, and MEMSAT  to predict transmembrane protein topology. In the fourteen completely sequenced dicistroviruse genomes (Table 1), we identified 240 overlapping ORFs of length equal or greater than 60 codons on the negative strand. Of the 240 ORFs, 113 were found in concordant genomic locations in two or more genomes. The concordant overlapping ORFs were assigned into 29 clusters (Additional file 1). There are 9, 1, and 19 clusters in phase 0, 1, and 2, respectively. The cluster size ranges from 2 to 9. In two clusters, 5 and 10, both in phase 2, there is a weak signature of selection. However, this signature seems to be a false positive, which was driven by the unique structure of opposite-strand phase-2 overlap (Additional file 2). In this structure, codon positions one and two of one gene match codon positions two and one of the overlapping gene. This structure leads to a situation where most changes are either synonymous or nonsynonymous in both overlapping genes and occasionally, to false signal of purifying selection on the overlapping ORF. In addition, one of the clusters (cluster 10) does not constitute a monophyletic clade, and is, therefore, unlikely to be functional. We therefore conclude that dicistroviruses most probably do not encode proteins on the negative strand. We thank Dr. Ilan Sela and an anonymous reviewer for their comments. This work was supported in part by US National Library of Medicine Grant LM010009-01 to Dan Graur and Giddy Landan and by the Small Grants Program of the University of Houston. NS carried out the analysis and wrote the draft manuscript. NP performed the motif search. DG and NP contributed to the interpretation of the results and the final version.